Each industry has a complex set of specific jargon, terminology and documentation that are established in the native language a given company operates in. When this company decides to expand its activities to a new foreign market, there are several critical steps it must take. Proper translation and localization of all documentation is one of them. 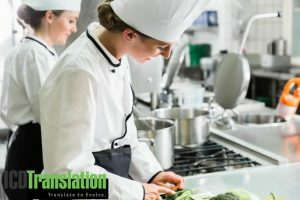 The Food Service, Equipment and Supply Industry is no exception when it comes to the necessity of utilizing established translation services for its business operations. The trick is to find a trusted partner who knows your brand image is important and is as passionate about your company as you are. 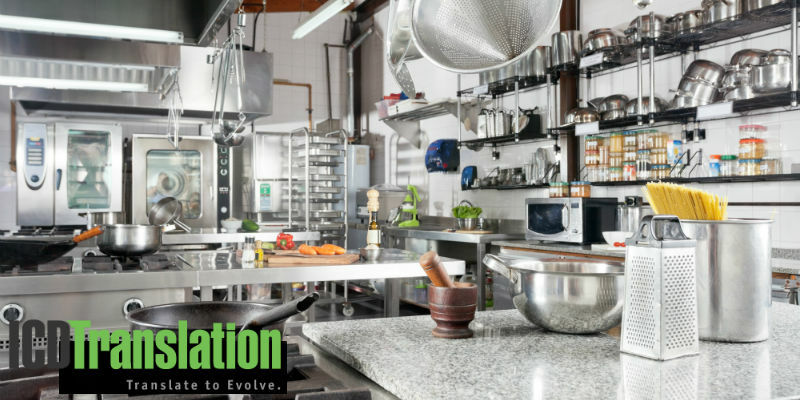 Below you will find, the critical points to proper translation and localization of the different types of documentation used by the Food Service, Equipment and Supply Industry. According to Michael Evans, a Forbes contributor, there are 10 key steps to expanding your business globally. All of them can be boiled down to one important word – planning. Careful, detailed planning of each and every element that involves the globalization of your business. This starts with market research that includes key elements such as market segmentation analysis, product gap analysis and SWOT analysis against competition. This is pretty important for the Food Service, Equipment and Supply Industry since the forecast for this year’s industry growth is not as vibrant as expected. Therefore, a detailed and careful planning process of all elements is a must. This includes legal readiness, meaning you need to create localized commercial agreements. The contracts you are going to sign should not simply be translated into the respective language but also take into account the local rules and requirements. You also need to consider proper translation and localization of all the other related documentation that includes, but is not limited to, certificates, user manuals, and technical specifications. Below, you will find some suggestions how to deal with this matter properly. One of the best ways to get all the benefits of translation and localization is to create documents that are translation-friendly. This will take some time and effort until you turn it into a habit, however it will save you a lot of money and shorten the entire process in the long run. Write brief, readable sentences following the standard English word order – (modifier) subject -(modifier) verb – (modifier) object. It is good to aim for sentences containing about 20 words. Use just one term to identify a given product or concept. The English language has a very rich vocabulary and sometimes there are multiple terms to call the same thing. Be consistent with the terms you use, since this will add clarity to the text as a whole and will make its translation into different languages much easier. Keep in mind that some synonyms may have a slightly different meaning in the foreign language, which can make significant difference. Avoid fancy, customized fonts – they might not be supported in all languages that you are planning to translate your document into. Provide sufficient space for the translated text. Many languages like German and Spanish take about 20% – 25% more space than English. Therefore, try not to overload the page with too much text, graphs, etc. Proofread your texts before submitting them for translation. You will avoid the costs to correct one mistake in several languages. You should note that experienced translators also notice and flag mistakes while translating but if the mistake is related to some technical specifications, terminology, etc. they may not catch it. During the translation and localization process make sure to choose the right translators, who will be able to do the job in accordance with your requirements. Keep the communication channels open throughout the process and always provide the translators with a list of the acronyms, abbreviations and specific jargon/terminology used. This will ensure much better results. Translation and localization services are provided by native speaking, properly trained translators. If the translator has experience in your field that’s a bonus you need to take advantage of. Complete translation management processes with professionals who are flexible and agile and are ready to walk an extra mile for their customers. Translation management system that allows the customer to view the translations in real time, track the progress, etc. using a simple, single platform. Linguistic proofreaders who will make sure that the final version is free of any errors. Finding the right LSP is worth researching before you choose. Especially if you are planning to translate your documentation in several languages and expect to have future translation projects. The right professionals will help you engage your global audiences in the right way. If you keep in mind these critical points when preparing to translate and localize your documentation, the entire process will run smoother and faster. Translation always plays a crucial role in creating a perfect brand image and helps you to reach the correct audience of your business. Translation in any language evolves around the cultural perspective, hence it is very important to consider culture when translating any piece of information. Really this is great blog to improve your knowledge about translation and interpretation. Role of translation always work to create a perfect brand and helps for reach the targeted audience of your firm. I will share this blog on social media with my friends. Really i am impressed after reading your blog. Today for globalization of any type of business such food service, equipment, supply industry, banking services and many more, translation in local language is essential to target local users (customers). In this Era it is very important play in Business growth because customers want to communicate and behavior with his cultural language. Really Appreciated blog, i will share this with my friends. How Do You Say “Best Translation Services” in Hmong?